At Sutton Bridal we make bespoke and made to measure bridal wear to the highest quality standards. The first stage is designing your dream gown. Some brides already have a strong idea of their dream gown; they can sit down with our designer who can produce several sketches. However you may wish to try on several gowns and our designer can help you choose your favourite elements from each. 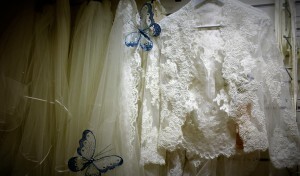 Your Wedding gown can be an eclectic mix of your favourites. You can have the neckline of one gown, the skirt from another and the silk from yet another.